I was just doing a quick check on the Content Strategist Job Board and saw that there are a lot of content strategy jobs listed! I saw 265 content strategist jobs listed. More than I would have expected in this economy. "As a Content Strategist inside the Design and User Experience team at Facebook, you will be responsible for the overall content strategy at Facebook. This includes the development of style guides, feature naming, language creation for new and existing user experiences, and executing all day-to-day content needs." Salaries also seem to be holding well. The average content strategist salary about the same as when I last checked back in December of 2008. Now that I have a print version of the e-book, it just makes no sense to have the two versions priced so closely together. So I'm giving the e-book price a 15% haircut and dropping it to $16.99. I've also added a way for those who buy the e-book version to get a print copy later at a big discount - for just $9.00. If you are interested, but on the fence, take a look at the e-book - if you like what you see you can always get a printed copy later and it all adds up to the same price. And it's always guaranteed, either way. 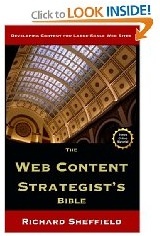 Own the e-Book version of The Web Content Strategist's Bible? Get a printed copy for $8.00. 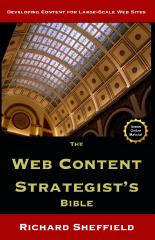 Now that there is a printed version of The Web Content Strategist's Bible, I want to give those who didn't have that option a chance to get one. If you check the site, you will notice that this offer is open to all future purchasers of the e-book version as well but it will cost them $9.00. I apologize for the lack of recent content strategy posts here. Doing actual content strategy at work has kept me from having any time to focus on the blog. This is one of those crazy times for me where multiple projects overlap and there is just too much to do in too little time. As some of you know, at UPS.com we do our big projects on a 6-month cycle, relaunching the site in July and January. Because of this cycle, June and early December are always crazy times. Right now I'm finishing up projects that will launch in July, we are already starting work on projects that will launch in January 2010 (actual writing starts soon to give us time to get everything translated), and I'm also doing sizing, scoping, and evaluations for projects planned for July of 2010! Hopefully things will settle down soon and I can post more frequently. Stick around :) I'm working on some interesting ideas. I had a recent conversation with a very good writer who was arguing that having a strictly designed content strategy would have a negative impact on the creativity of the writing. I couldn't disagree more and we nice polite argument about it. I think having a defined process, whatever it is, frees other parts of the mind to ficus on generating creative ideas rather than dealing constantly with trying to figure out what comes next. Visual artists and writers usually have a process that they repeat every time so they can shut down that critical, logical part of their mind and create. Stephen King writes at the same place and time every day and uses the same process. Picasso had a process, Jackson Pollack had a process (however odd it was), so I see no reason why a content strategist shouldn't have a well-defined content strategy process.